When Dallas/Fort Worth International Airport opened in the early 1970's, it was termed the "Airport of the future." That future is now, and the new Denver International Airport is being termed the "Airport of the 21st century." When Dallas/Fort Worth International Airport opened in the early 1970's, it was termed the "Airport of the future." That future is now, and the new Denver International Airport is being termed the "Airport of the 21st century." Denver International covers an area roughly half the size of the city of Denver and uses concourses as long as 0.6 mile. The $2.7 billion, 53-square-mile airport represents state-of-the-art technology for environmentally conscious air transportation management. Denver International serves as the hub airport for two commercial carriers, including maintenance and fueling facilities. 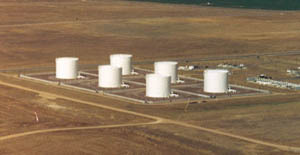 Six above-ground, welded, steel storage tanks constructed on concrete ringwalls (Figure 1 inside) make up fuel storage. All are equipped with Phase II vapor recovery technology designed to cut VOC emissions by 95 percent. Each tank is 85 feet in diameter with acapacity of more than one million gallons. The tank farm is located approximately one mile north of the apron areas where refueling occurs. Underground pipelines convey the fuel from the terminal to dispensing points, while fuel is brought to the facility via underground pipelines owned by a private contractor. A 5-foot-high concrete wall surrounds the terminal complex. This structure provides compliance with 40 CFR 112, which requires a containment volume sufficient to hold contents of the largest tank for a short period during a catastrophic tank failure. Interior dikes, of similar design and construction to the exterior walls (reinforced concrete), are provided as a fire-spread minimization technique, a common practice. Seaman Corporation, 1000 Venture Boulevard, Wooster, OH 44691. Tel: 800-927-8578; Fax: 330-263-6950.